So, I've been wanting a pocket watch for a while now. I miss having a watch on hand instead of checking my phone all the time (and when it's cold it's not good to take the iPod out too much), but don't miss having a band around my wrist that makes a mark and is always getting caught on things. I had a Maneki Neko watch that a friend gave me which I loved, but it broke. On a whim, I searched for "maneki neko watch" in Google and found one. It's nice, but then I realized: watch face + chain + clasp + bead + bead = something I can easily make myself. I still have a bunch of beads from my earring-making period, not to mention having trouble tossing earrings with a nice bead even if I lost the other one, plus jewelry wire and pliers. Watch faces are pretty cheap. I think I'll make a few for myself for different occasions. 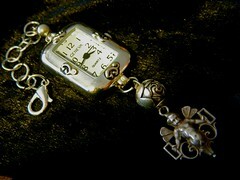 This is a fairy watch inspired by the Changeling: The Lost role-playing game I'm in now. I'm thinking of doing a steampunk watch and a ninja one. It looks lovely, my little faerie princess, I can't wait to see the Steampunk one!